At Rio's Olympic Park, Rio Mayor Marcelo Crivella announced that the 500,000 square meter recreational park, closed since December 2016, would reopen in September. RIO DE JANEIRO, BRAZIL – This past weekend, Rio Mayor Marcelo Crivella announced that Parque Radical (Radical Park) at the Deodoro Sports Complex, one of the many Rio 2016 Olympic legacy projects for Rio’s Zona Norte and Zona Oeste (North and West Zone) residents, would reopen in September 2017. Rio Mayor Marcelo Crivella and Secretary of Sports and Leisure, Patrícia Amorim, celebrate the one year anniversary of the Rio 2016 Games at Olympic Park, photo courtesy of Prefeitura do Rio de Janeiro. “Everyone will be able to go to the park,” exclaimed the Mayor about the 500,000 square meter park that was the scene of canoe slalom competitions and BMX events during the Rio 2016 Games. Parque Radical first opened to the public in December 2015, then closed for several months for the Olympics. The site’s water attractions reopened to the public in September 2016, benefiting the many residents of the surrounding neighborhoods. But, the fun was short-lived as the site was promptly closed again at the end of 2016 when the company managing the park closed operations. The Mayor’s announcement came during a visit to Olympic Park in Barra da Tijuca for a series of events commemorating the one year anniversary of the opening of the Rio 2016 Olympic Games. 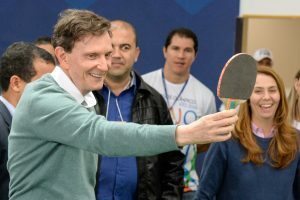 At the Carioca Arena 3, Mayor Crivella attended a series of workshops and got to try his hand at table tennis, photo courtesy of Prefeitura do Rio de Janeiro. Accompanied by the Secretary of Sports and Leisure, Patrícia Amorim, Mayor Crivella toured the various venues at Olympic Park, the largest of the Rio 2016 Olympic competition hubs. 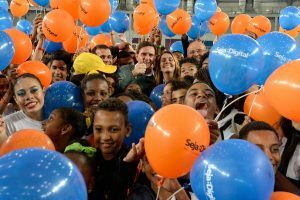 At the Carioca Arena 3, Crivella and Amorim attended a series of sports workshops for about 400 hundred children who had the chance to try their hand at table tennis, badminton, judo, and gymnastics. Though Olympic Park has been little-used since the Games and has even been labeled as “abandoned” in many circles, Sports Minister Leonardo Picciani, who also attended the event, praised the support of Rio City Hall in overseeing the site’s various venues. “I bring here my word of gratitude, of respect for this Olympiad and everything we did,” Crivella added. “And my commitment is for all this to continue as a lighted torch here and in the heart of every Brazilian.